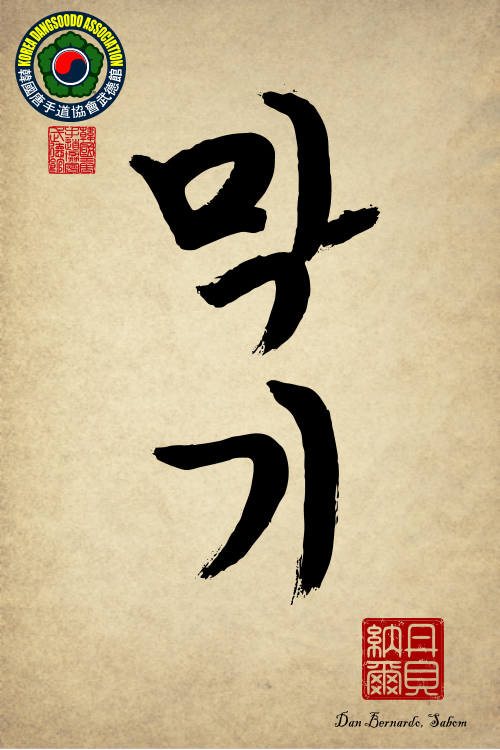 Mahkkee 막기 is pronounced "Uke" 受け in Japanese. Anyone who practices a Japanese martial art will know what Uke means. And in case you were wondering, it doesn't mean "block". In fact, in many instances of it's use it means the exact opposite. It means "to receive". This is incredibly important because it may change the entire way you view "blocking", especially if you practice Tangsoodo. You see, if you are blocking in a way that is meant to simply stop the opponents attack, you aren't understanding the full concept of Mahkkee. ... it doesn't mean "block". These receiving techniques from Okinawa-te are much more complicated than just putting up a defense. Think of trying to catch a baseball without a glove. If you try to meet the balls velocity with force, you will more than likely hurt your hand. Instead you cradle it, and receive it. Now think if you had the ability to take that velocity, receive it, and instead of letting it disperse you used it to throw the ball back? You wouldn't need to use much energy because you were taking the energy already being in use. This is Uke... this is Mahkkee. Let's hear it for the little guys! With this understanding you don't have to be huge and musclebound to be able to block punches from people twice your size. Does anyone remember how short Hwang Kee was? Funakoshi, Matsumura Sokon, Anko Itosu... all short guys! Many of you are probably asking, but what about all of those times my Sabom or Kyosa told me to block hard so to hurt the attacker on the defense? Well, first of all, I'm glad you were paying attention! However, you are only looking at part of the equation. The concept of receiving a technique does NOT require you to be soft, you can receive the technique quite violently. But you have to pay attention to where your energy is going. If you are trying to force the attack in a direction seemingly contrary to it's initial direction, you aren't receiving. However, if you can displace an attack allowing their energy to continue in a similar direction, you can do so with great amounts of waist twist and power. If you look at many of our hyung, you can see that in most instances a block is followed by an attack. This isn't an accident. The defense is a receiving technique, gathering and displacing the attackers technique all the while following it up with an attack of your own. Have questions about these applications? Ask your Sabom, or even your Kwanjang!